“Europe – Our History”, a textbook on European history created by a joint project team of Polish and German experts working together, is the continuation of a dialogue conducted over a period of decades by historians, geographers and history educationalists, primarily in the context of the Joint German-Polish Textbook Commission. The creation of a concept for a textbook on European history suitable for use in both German and Polish schools has represented a beneficial and productive new stage in the Commission’s work. 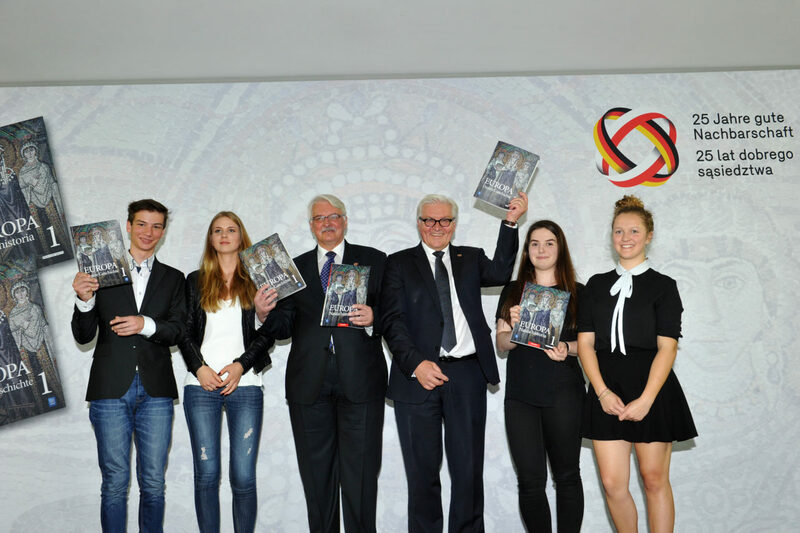 In December 2007, the foreign ministers of Germany and Poland signalled their political support for the development of a joint Polish-German textbook. Accordingly, at the beginning of 2008, the governments of the two countries agreed upon the creation of the requisite organisational basis for the project. On the German side, the Federal Foreign Office and the Standing Conference of the education ministers of the German federal states, with the Ministry of Education, Youth and Sport of the Federal State of Brandenburg acting as lead, assumed responsibility for the project. Their counterparts on the Polish side were the Ministry of National Education, the Ministry of Foreign Affairs and the Ministry of Culture and National Heritage. Additionally, the project received substantial support from the Foundation for Polish-German Cooperation. The two heads of the German-Polish Textbook Commission oversaw the project’s academic side, ensuring it benefited from the right expertise. Academic coordination of work on Volume 1 was in the hands of the Georg Eckert Institute for International Textbook Research. Member of the Leibniz Association in Braunschweig, Germany, and the Centre for Historical Research in Berlin of the Polish Academy of Science. The institutional framework of the project comprises two panels or committees: a ‘steering committee’ and an ‘expert panel’. In 2010, the latter of these issued recommendations which laid the conceptual foundations for the textbook series which has now come into being. The series, planned to encompass four volumes, is a joint Polish-German product in more than one sense. The close cross-border cooperation between the publishers Eduversum and Wydawnictwa Szkolne i Pedagogiczne, the work’s authors, academic coordinators and experts for the various eras covered, while vital, is only part of the story. The materials produced thus far also represent the result of a long process of discussion which sought to identify ways to make a textbook into a space for a perspective on history which has the capacity to raise learners’ awareness of the variety and divergence of points of view, interpretations, and approaches to history education which go into any presentation of the past. This means the project is of great significance for Polish-German relations, with regard to both educational and research policy. Those involved from both countries have shown their willingness to include their neighbour country’s historical experiences in the teaching of history in their country’s schools and to enter into more profound academic dialogue on historical issues. This notwithstanding, it is important to note that the textbook series is not intended to be a history of Polish-German relations, but rather – in the spirit of the series’ title – a history of Europe which meets the curricular stipulations in place in Germany and Poland with regard to content and the development of competencies. In this context, the series’ objectives go considerably beyond the closer Polish-German context, making the work relevant to a wide range of potential target audiences. Europe – Our History seeks to enable learners to locate their own country’s history in the European context and view it from various different perspectives, thus developing an awareness of history that reflects critically on issues and events and permits them to engage constructively with the diversity of historical experience. “Europe – Our History” sees itself as pointing the way to a European idea of the continent and its history which approaches the diverse range of experiences and interpretations of history in Europe held by its various nation states with a transnational mindset, the capacity for empathy, and knowledgeable discussion and debate.